Gray Ratsnakes are native to North America, but are only found in two locations in Ontario: the Frontenac Arch (eastern Ontario north of the St. Lawrence) and the Carolinian forest (north shore of Lake Erie). 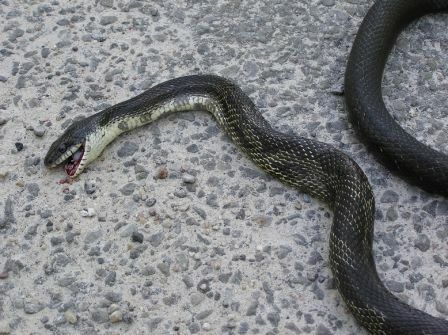 It is Ontario’s largest snake and can reach lengths of more than 185 cm (6 feet). Newly hatched snakes are patterned with dark grey or black blotches and spots on a light grey background. As it gets older, the pattern fades to mostly black. The chin and throat are a striking white colour, sometimes with grey and black blotches. Gray Ratsnakes need a variety of habitat features, including forests and edge habitat (where one type of habitat meets another). They need good sites for laying eggs, such as rotten interior tree cavities, stumps or compost piles. They spend their winters underground in communal hibernation sites (hibernacula), which they tend to return to each year. 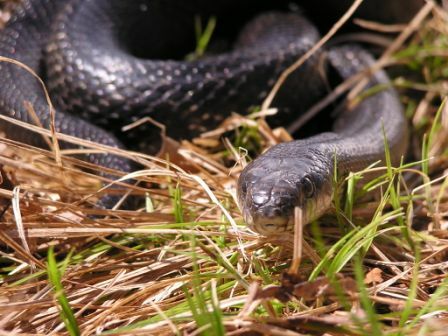 These snakes reach maturity at about seven years and can live up to three decades. They mate between late May and mid-June, and females usually reproduce every two to three years. In 2007 the Committee on the Status of Endangered Wildlife in Canada (COSEWIC) assessed the Frontenac Arch population and determined it is “threatened” and that the Carolinian population is “endangered.” These findings are reflected in the Ontario Endangered Species Act (2007) as well. Because they need many years to mature and only reproduce every couple of years, and because they live for a long time and are creatures of habit that return to their favourite haunts routinely, any sort of disturbance can have a large negative effect on the populations. Such threats include habitat degradation, fragmentation or loss, as well as mortality from roads, destruction of hibernacula or negative encounters with humans. Currently a recovery team has been established to develop recovery actions that range from stewardship and outreach activities to habitat and genetic research. 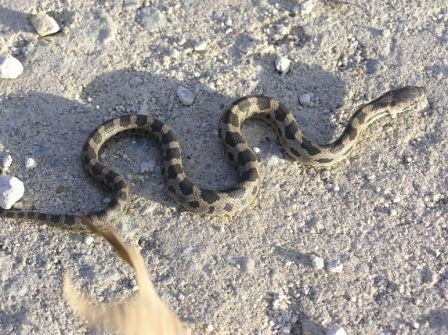 The team’s goal is to retain the current distribution of the Gray Ratsnake along with its population size in the Frontenac Arch population and to achieve self-sustaining populations in the Carolinian group by increasing its distribution and size. Learn more about Gray Ratsnake recovery efforts by clicking here. Learn more about general species at risk recovery in Ontario by clicking here. From: Kraus, T., B. Hutchinson, S. Thompson and K. Prior. 2010. 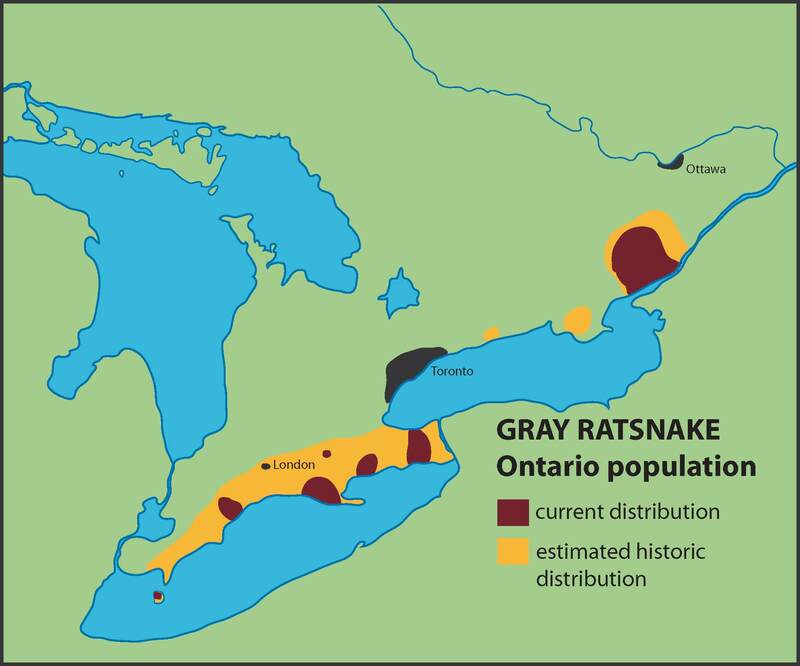 Recovery Strategy for the Gray Ratsnake (Pantherophis spiloides) – Carolinian and Frontenac Axis Populations in Ontario. Ontario Recovery Strategy Series. Prepared for the Ontario Ministry of Natural Resources, Peterborough, Ontario. vi+23 pp.